ST. GEORGE — A driver was injured in a crash after police say he attempted to make a U-turn on Red Hills Parkway Monday evening. St. George Police responded to the incident on the westbound lane of Red Hills Parkway just west of where it intersects with East Waterworks Drive. 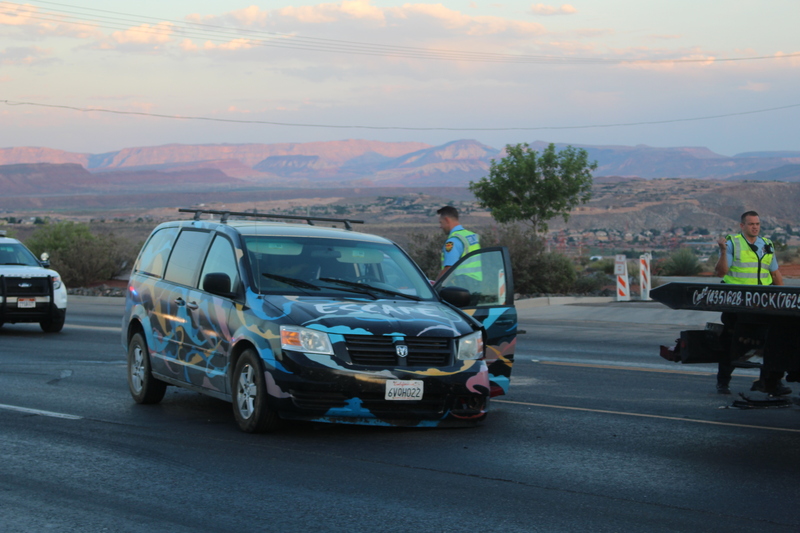 A man driving a Dodge minivan pulled to the side of the road as a red Volkswagen passenger car approached the area in the outside westbound lane, St. George Police Sgt. Tyler Cowan said. “It looks like the van for some reason decided to make a U-turn,” Cowan said. As the man in the minivan attempted to make the turn, Cowan said, he crashed into the passenger car. Medical responders from Gold Cross Ambulance arrived and transported the driver of the minivan to the hospital. The extent of the man’s injuries was unknown at the time this report was taken. No other injuries were reported. The driver of the minivan will likely receive a citation for making an improper turn, Cowan said. Both vehicles were damaged and inoperable following the crash and were towed away. Traffic in the area was slowed but mostly unimpeded. St. George Fire also responded to the scene. Where is this van from? Mars? Looking at the van I might think the driver would say something like; “far out, like, man, that was some really heavy **** I whiffed”.